Weekly Update 2016-49: Grungy garage rock from Toronto's own Dilly Dally, the etiquette of using UberPool, and the delicious type inspiration of Jeremiah Shoaf's Typewolf. Music festivals are serious business. If you're not in peak physical condition, or if you don't have the go-getter attitude of an overachieving maniac, you're probably going to miss some bands that you wanted to see. And each additional stage at a festival just multiplies this. So, when Dilly Dally played Wayhome on the Sunday of the festival weekend, I was too drained to wake up in time to catch them on a side stage at 2:30PM. I vowed that I would see them in Toronto, and eventually they did come here to play (especially since they're from Toronto). They opened for Grouplove at the Danforth Music Hall in October, and tickets were just too expensive (thanks, Grouplove) to justify a love of an opening band. And so I continued to wait. I have now completed four out of five Munich posts, only one to go. As much as the process of looking back on my trips helps me to remember all the cool stuff I did, the process of going through the photos and writing the posts is even more of a transporting experience. I have also been working on transporting my portfolio site over to Github, and spent three hours cleaning the code on the weekend. I can't believe how my coding habits have improved since I started working at EventMobi. I'm slowing down on the website stuff for the moment until I can sit down and get some coding questions answered from my trusty coding friend, so I'll be focusing more on my blog redesign. The sketches of the homepage are somewhat complete, so I'd like to move into wireframes this week. I'll also be focusing on reading some of the books that my Chai Mitzvah mentor gave me last week, and posing some questions to her via email. I want to get that going tomorrow night so she knows what to expect of me throughout the rest of the school year (and doesn't think I'm a flop). What if you know that a less direct route will be faster, but others in the uber will be affected and/or may not agree with your suggestion? Who wins? Probably the route that Uber provides. But it seems like they don't use an API that accounts for unexpected traffic like accidents etc. This is my new favourite website. I have always appreciated good typography in print, but felt that the joy is somewhat lost in digital media. I can only explain it in a really weird way so please forgive me: good print typography makes me want to lick the page. And until I found Typewolf, I hadn't really felt that way about digital type. It helps that the site's own typography is also delicious. 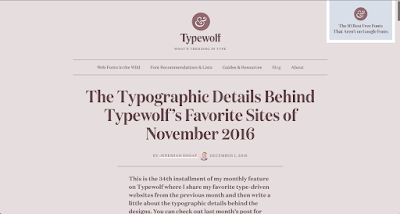 The site has many excellent features, one of the best ones being a monthly chronicle of excellent type on the web. Not only do these bring back the joy I felt about good printed type, but they inspire me to work on the typography of my website and blog, both of which are quite lacking. And they show me that the urge to lick the page is possible with web design. Check out their November issue here. And, as luck would have it, this site has, by pure chance and luck, solved my original issue of the terrible dumb quotes that Blogger has foisted upon me. "This is terrible and incorrect." 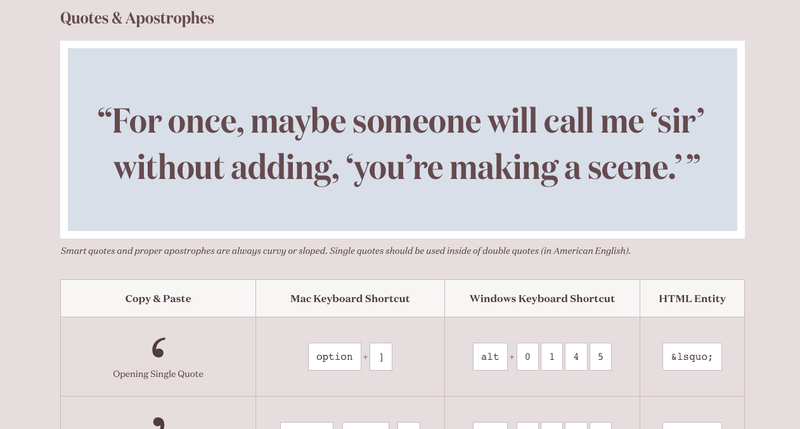 The site taught me the keyboard shortcuts for smart quotes, and a whole lot about proper usage. So not only the how, but also the why/when. Context and knowing when to use the tools you've been given is as important as knowing how to use them. 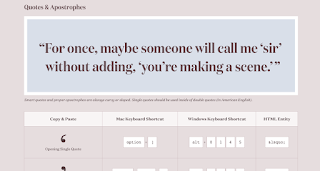 You can check out the very, very special typography cheatsheet here. And if all that weren't enough, it's cheeky. Even from my first once-over of the site, I am so inspired. For example, who knew that a dark maroon on top of a powder pink background would not only be legible, but a joy to read? Who knew that a stark white eight-pixel underline makes a beautiful link affordance, and even moreso with a white background hover effect on a transition of 300 milliseconds? You'll be seeing a similar style here soon, to be sure. 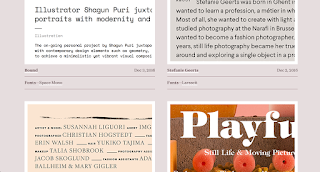 I’ve also noticed that other typography sites tend to be written from a type designer’s perspective rather than from the perspective of someone who actually uses type in their day-to-day work. 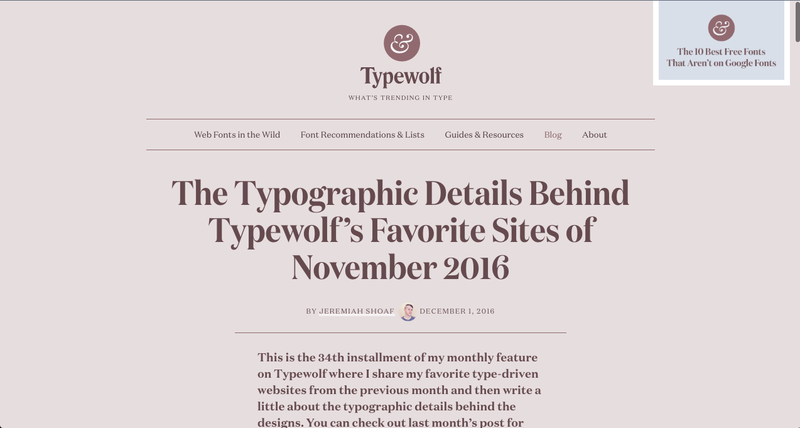 I’ve been a designer for 15 years, so everything on Typewolf is approached from a designer’s perspective. It's so true, that you really don't see sites quite like this, that show typography in the wild, in real examples that can be understood in a practical sense. 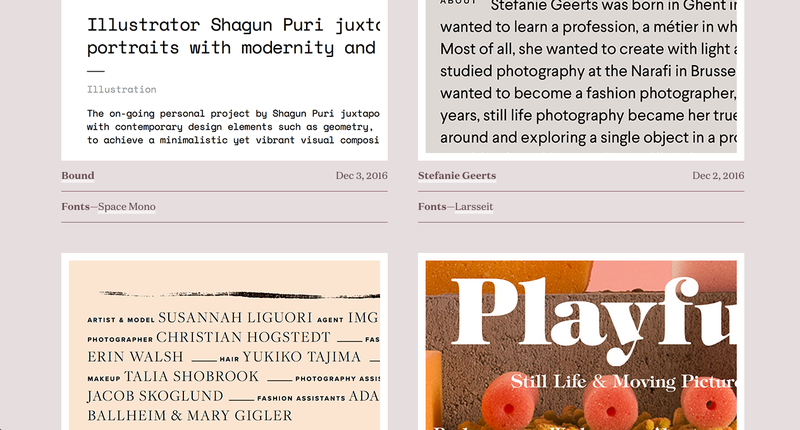 I implore you to check out the site yourself and savour the typography as it was meant to be enjoyed.